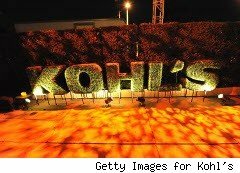 Save 15% to 20% with this Kohl's coupon, good today through Sunday, Mar. 20, 2011. Knock 15% off your bill, or 20% if you spend $100 or more. To get the discount, print the physical coupon an bring it to the store or plug in coupon code SPECIAL15. If you spend $100 or more, use coupon code SPECIAL20 to get 20% off. The coupon is valid on regular, sale and clearance merchandise. One coupon per customer. Shipping is free when you spend $75 or more, though surcharges for especially heavy or bulky items still apply. Caveats: Tax and shipping do not count toward the $100 threshold. Dollar-off discounts are applied prior to percent-off discounts. Not valid on prior purchases, gift cards, payment on a Kohl's Charge account or in conjunction with any percent-off discounts, including the Senior Citizen discount. Offer also not valid on the purchase of Kohl's Cares cause merchandise or other charitable items.